Aquatherm's polypropylene-random (PP-R) pipes were chosen for the project due to its non-reactive nature and ability to operating in freezing temperatures. "It’s a dang easy product to use. I needed a product that would match the design constraints, and it had to be affordable, but the ease of installing Aquatherm was a bonus." The durability of PP-R makes it a great fit for low-temperature systems, such as transporting chilled glycol. A heat-fused PP-R joint becomes a 100% continuous piece, eliminating costly delays from leaks. The lightness and flexibility of the piping allowed for the entire system to be prefabricated on the ground and then lifted and installed into place. The brewery's owners needed to transfer glycol from the chiller to the fermenting tanks between 28˚ and 30˚ F using a piping material that would not be brittle (PVC) or costly (copper). Trying to establish a new microbrewery these days is a very competitive venture. According to the Brewers Association, 2,538 craft and non-craft breweries of all sizes currently are operating in the United States, 409 of which opened in 2012. But if you put time into your beer, pay attention to the details, set up your brewing system just so and throw yourself headfirst into the social-media-marketing frenzy, you might be able to develop a notable niche in your local marketplace – and maybe beyond. With all of this in mind, Nathan and Haley Cowan, Geoffrey Williams and Mathew Sweezey, the founders of Eventide Brewing in Atlanta, are well on their way to putting their mark on the southern suds scene. Eventide’s owners plan to be in production by October 2013 and shipping barrels to bars and brewpubs across the region later this year. They have five mainstay styles currently in the works, three of which will launch this year: dry Irish stout, Kölsch-style ale, American pale ale, Hefeweizen, and a red ale to follow. Completely unpretentious, Eventide’s brewing process is accessible to anyone with an Internet connection – the brewery has no secrets. Eventide has a fierce social-media presence with the photos, videos and blogs to prove it. The brewery’s website, eventidebrewing.com, will even get an update at the same time the kegs begin rolling out the door. When it came to designing the brewing system, Nathan Cowan, currently a mechanical engineer by day and Eventide’s CEO by night, wanted to build a structure much like his beer, smooth and straightforward. Although the company was founded in 2011, the Eventide team finally rented out a 12,500-sq.-ft. factory/warehouse space in January 2013 and began interior construction in March. After much planning, purchasing, applying for permits and patiently waiting, Eventide’s brewing equipment arrived in July and Cowan was able to start piecing together the direct-fired, two-kettle system. “It’s a plug-and-play operation for the most part,” Cowan said. The brewing system is comprised of two kettles – the mash/lauter tun and the boil kettle/whirlpool – and a hot-liquor tank (HLT), which basically acts as a hot-water heater. Hot water flows from the HLT to the mash/lauter tun, in which the water is mixed with grain to create a mash. The mashing process creates a sugar-rich “wort,” which then is strained in a method known as “lautering.” The wort next travels to the boil kettle/whirlpool, in which it is boiled with hops and other flavoring ingredients. At the end of the boil, the whirlpool eliminates large sediment from the final product. The wort then pours into one of three stainless-steel jacketed fermentation tanks, each of which has a 15-barrel capacity; the tanks feature a glycol-cooling system that sits between the jacket and the inner tank and maintains a tank temperature of 45˚ to 76˚F. The wort ferments for eight days, then the resulting beer moves to a 15-barrel-capacity bright (or conditioning) tank, in which the brew is cold-crashed to 32˚, clarified and carbonated. Finally, the signature suds are ready for packaging. Central to the five-barrel system – meaning five barrels of beer can be produced per brew length – is the glycol-cooling structure. “We have to be able to manipulate that temperature to the degree,” Cowan said. To run the glycol from a PRO Refrigeration chiller to the fermentation tanks, Cowan needed a very specific piping system, something that wouldn’t leak or weaken when experiencing extreme temperatures. Although quite useful in brewing production, glycol is rather expensive: “You would just lose your shirt if you had a catastrophe,” Cowan said. Cowan originally considered using PVC piping, but the glycol has to be kept between 28˚ and 30˚; PVC piping starts to become brittle at temperatures below 32˚. Copper also was contemplated, but its high price was a detractor. Additionally, “soldering copper is a really hard skill to master, and even then you’re not guaranteed that it’s leak-free,” Cowan said. Cowan enlisted his father, retired mechanical engineer and general contractor, Tom Cowan, to find a solution. Tom Cowan called the Alpharetta, GA, branch of Ferguson Enterprises, a plumbing-supplies distributor with 1,350 locations serving customers throughout the United States, Puerto Rico, the Caribbean, and Mexico. Tom Cowan was connected with Jeff Long, Ferguson’s Georgia-branch proprietary brand sales specialist. Once he heard about Eventide’s requirements, Long immediately suggested Aquatherm polypropylene-random (PP-R) piping, which Ferguson had successfully used in breweries in Birmingham, AL, Salt Lake City, and other cities. A lightweight, environmentally friendly piping system, Aquatherm’s Blue Pipe® is specifically engineered for hydronic, geothermal, and industrial applications; the piping’s most important feature on this project was that it is high-heat stabilized. “Cowan was on board from the beginning,” said Aquatherm representative Mike Nix. Nix is president of Atlanta’s Mike Nix & Assoc., a manufacturer’s representative firm focused on territories in Georgia and Tennessee. “You usually have to sell a product, but that wasn’t the case on this project,” Nix said. Cowan was happy to spend only $5,000 of his $150,000 project budget on 500 ft. of the Aquatherm Blue Pipe in 1-, 1¼-, 2- and 3-in. sizes and assorted fittings and valves. Long estimates Cowan saved about 20% by selecting Aquatherm PP-R piping over copper. “Copper is a lot more expensive and has a shorter life span than Aquatherm,” Cowan said. 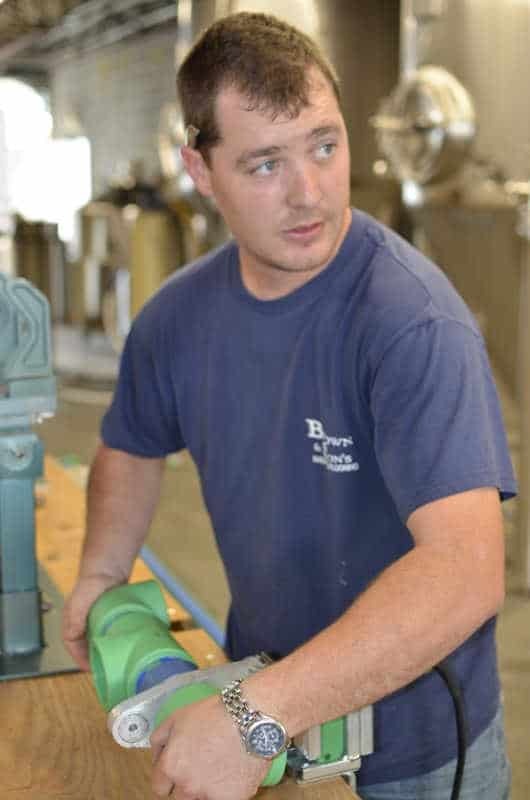 After the brewery system plans were finalized, Long trained Cowan on Aquatherm’s unique welding process. 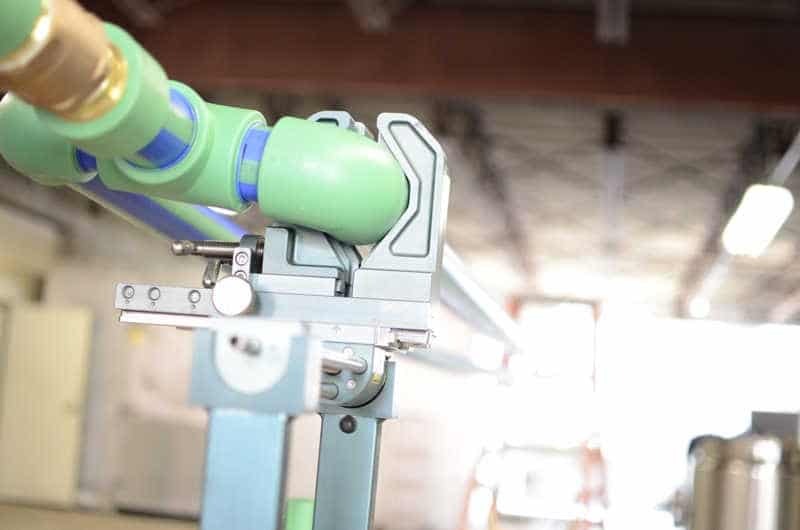 Aquatherm PP-R piping uses reliable heat fusion to form connections, which bonds both sides of a joint into a single, homogenous material without the use of chemicals or mechanical connections, eliminating systematic weaknesses and fail-points in the pipe. The seamless heat-fusion connections, combined with the piping’s resistance to corrosion and abrasion, help to ease leakage concerns. Using a rented ASDAC welding jig as well as Ritmo and Widos welding irons, Long and Cowan were able to install all of the piping in 12 hours. “It was a pretty easy job,” Long said. “There weren’t a lot of things that we had to work around. We were able to construct the entire system on the ground in a controlled environment, then lift it up in the air and hang it” from the ceiling. Cowan estimates the new system will allow Eventide to produce 75 barrels of beer per month to start, increasing to 150 barrels per month in 2014 before any additional tanks need to be added. Cowan also expects the brewery eventually will segue into can production. Eventide’s founders are already looking into the future: with a forecasted growth of at least 35% each year, Cowan thinks the brewery’s success will outgrow the equipment and space within two and a half years.